The first time I went to the Oregon Coast in 1993, we looked out over that ocean and sort of freaked out. We had made it all the way out here, relatively intact. Our new lives were beginning. Fast forward all these years and we’ve spent many weekends over there in expensive beach houses, flapping tents or our very favorite, Goo & Fran’s beautiful Cove Cabin. Funny how that little part of the world makes you decompress a bit. Take things easier. Eat some chowder. Look out at the big water. Think about creatures that would bite you in half in a second. All fun stuff. 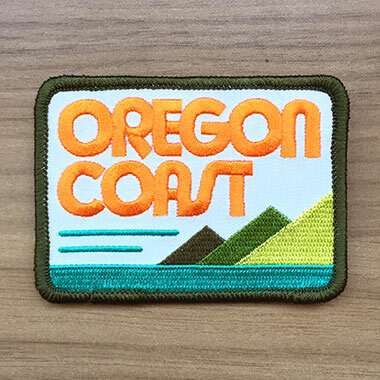 We made a patch inspired by the Oregon Coast, those ocean breezes and those green, wet mountains that meet the sea. Such a beautiful place. 02. Inspired by days at the Oregon Coast. 03. 3.5” x 2.5” in dimension. 04. Proudly manufactured by the threadmasters over at Brewery Outfitters! 05. In stock forever, until the ocean swallows us up. 06. Sand in the crack!